In 1950 Dad owned an old wartime Commer Army truck complete with canvas canopy that he used for carrying green grocery to his customers in nearby Rayleigh. I would scrounge a lift to Hockley (Essex) primary school in the mornings. I had to walk the two miles home in all weathers. 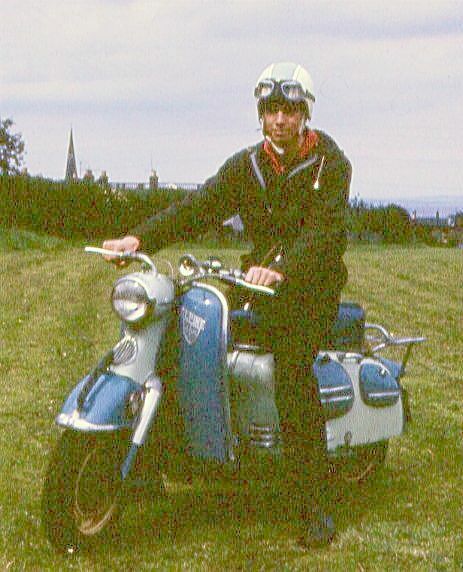 However, because the Commer was notoriously difficult to start on a cold morning, I eventually used to cycle both ways. Later, at High school in Rayleigh, I used to cycle both ways or catch the bus (No 22 from Hullbridge) if the weather was a bit iffy. In my final days at school, I used a moped. In my final days at school, I used a moped. Me too. I acquired it by building a record player for a friend of my sister. My dad only got his first car in 1965 and never ever dropped any of us off at school. He went to work later anyway most days and we were expected to bike it or walk whatever the weather. Car ownership was not as universal in the 50s and '60s. i don't remember being taken to school or collected in a car unless we had a dentist or doctors visit in school hours. Up to the age of 12 I walked to school with a friend who lived a few houses from us. His father was a car salesman for a Volvo dealer and always took a car from the dealership home. Usually these were cars one to four years old or so. Sometimes he offered us to bring us to school, with we of course always accepted. One week was memorable because we got taken to school TWICE in an E-type Jaguar. I still remember the ride in that very tiny space of the rear seat. My old friend has owned a 2+2 E (V12) for almost thirty years now, maybe a result of those early rides. I came close to buying a 2+2 E-type, the cheapest way of owning an E-type but I decided then I could not live with it knowing the other variants were so much more elegant. US (where you are now) or Essex UK in those days? If you're interested in Eastern National feast your eyes. Thank you Penman, That link to Eastern National certainly brought back the memories for me. My parents moved to Hockley in Essex in 1950. I was seven years old but can still remember the red Westcliff-on-sea and the blue and cream Southend Corporation buses. Suddenly the red vehicles disappeared and we had the green Eastern National. Keith: Did you click on the Home Page button at the bottom of that page? Penman, No, I hadn't hit the home page button, but having done so now, I can see I have many hours of reading ahead of me! Thanks! Essex, UK. Chelmsford to Brentwood. Carrying a lump of coal. The reason I was showing an interest in EN #30 is that decades ago I was a conductor at Brentwood depot & the route was one of several I punched tickets on.